The Mob was the first book to deal with the bloody history of Irish involvement in the American organised crime scene. Long before the Mafia had arrived on the shores of the New World Irish gangsters were plying their trade of murder and mayhem. 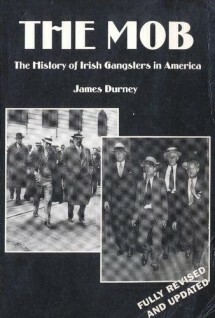 The Mob follows the careers of many of the Irish gangs and gangsters from the early days of the Dead Rabbits and Plug Uglies to the Westies and Whitey Bulger. Its all here – the murders and the motives, the gang wars and the executions, from the St. Valentine’s Day Massacre to Boston’s “Irish War”. First published in 1997. The Mob has since been reprinted five times and updated twice. In this 2005 edition three further chapters have been added, dealing with Whitey Bulger’s bloody rise and fall; Henry Hill’s continuing mob career after he went into the Witness Protection Program and new revelations about the Jimmy Hoffa murder by Frank “The Irishman” Sheeran. Available at all good bookshops or to purchase online from this site.